Authors are asked to submit manuscripts to one of the following sections of the Journal of CANCEROLOGY: Review articles and Clinical Cases. Authors will be asked to send their paper in electronic format in English or Spanish language. These instructions comply with those formulated by the International Committee of Medical Journal Editors (www.icmj.org). For further details, authors should consult the article: Uniform requirements for manuscripts submitted to biomedical journals (http://www.icmje.org/recommendations/browse/manuscript-preparation/preparing-for-submission.html). 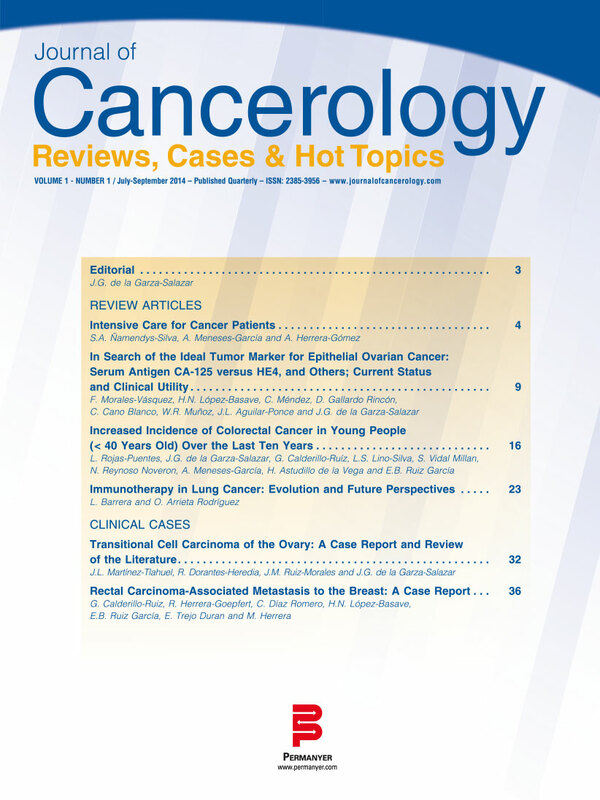 The Journal of CANCEROLOGY publishes papers reporting original scientific, clinical, epidemiologic, and social research, which contribute to the overall knowledge of the field of Oncology. Currently, the Journal publishes review articles and Clinical Cases. Manuscripts submitted to the Journal of CANCEROLOGY will be accepted on the understanding that the authors have not submitted the paper to another journal or published the material elsewhere. Authors are asked to disclose any affiliations, including financial, consultancy, or institutional associations that might lead to bias or conflict of interest. Manuscripts should be 20-22 double-spaced pages, including references (max. 75 references), figures, and tables. All manuscripts are peer-reviewed. Letters to the Editor should not exceed 1,000 words with no more than one figure or table. These letters are subject to review by the Editors, and may be rejected without written explanation. In some instances, correspondence will be peer-reviewed. The title page should carry the full title of the paper and a «running head» of no more than 40 characters including spaces. The title page should also include the first name, middle initial, and last name of each author (no more than three are accepted). If the work is to be attributed to a department or institution, its full name and location should be included. Persons listed as authors should be those who substantially contributed to the study’s conception, design, and performance. Sources of support for the work in the form of grants, equipment, or drugs should be included on the title page. Disclaimers, if any, should appear on the title page, as should the name and address of the author responsible for correspondence concerning the manuscript. The abstract should be followed by a list of 4-6 key words or short phrases which will assist in the cross-indexing of the article. The terms used should be from the Medical Subject Headings list of the Index Medicus (http://www.nlm.nih.gov/mesh/meshhome.html). References should be numbered consecutively in the order in which they first appear in the text. They should be assigned Arabic numerals which should be given in brackets, e.g. . References should include the names of the first three authors (adding et al.) if more than six in total, or all if there are not more than six names (https://www.nlm.nih.gov/bsd/uniform_requirements.html). References should also include full title and source information. Journal names should be abbreviated as in the Index Medicus (http://www.ncbi.nlm.nih.gov/nlmcatalog/journals). References should be not more than 75 in total. Personal communications and unpublished work should not be included in the reference list, but should appear in parenthesis in the text. Submitted but not yet accepted work should not be cited. Work accepted for publication but not yet released should be included in the reference list with the words «in press» in parenthesis after the name of the journal. References must be verified by the author(s) against the original documents. References to figures and tables should be made in order of appearance in the text and should be in Arabic numerals in parenthesis, e.g. (Fig. 2). Figures should be professionally drawn and photographed; freehand or typewritten lettering is unacceptable. Photomicrographs must have internal scale markers. If photographs of people are used, their identities must be obscured or the picture must be accompanied by written permission of the subject to use the photograph. Only black-and-white prints are admitted (except as stated below). If a previously published figure is used, the original source must be acknowledged and written permission for print and electronic (internet and CD-ROM) formats from the copyright holder must be submitted with the material. Permission is required regardless of authorship or publisher, except for documents in the public domain. Figures may be reduced, cropped, or deleted at the discretion of the Editors. For publication in the Journal of CANCEROLOGY, authors are not asked to pay anything per manuscript when it is accepted for publication. The Journal of CANCEROLOGY will publish, on special request, articles with color provided that the addition cost for this (as quoted by the Publishers) is prepaid by the author. Authors who wish to have color photos/graphics published with their articles are requested to pay an amount of USD 35.00 per page printed with photos/graphics. Payment should be made by credit card at the time of submission of the corrected PDF of their article (final proof). Double spacing should be used throughout the manuscript, including the following sections, each of which should begin on a separate page: Title page, Abstract, Text, Acknowledgements, References, Figures, Legends, Tables, and Captions. Abbreviations should be those accepted internationally, and defined where they first appear in the text. Systeme International (SI) units should be used where appropriate ((www.bipm.fr/en/si/si_brochure/).